2017 was a really fun year for us. Sure I put on a few pounds from all of the delicious food that kept coming my way and am now on a fairly low carb/low sodium diet (outside of all of the crazy culinary stuff we get into to) so hopefully by summer my belly will be a little less rotund. Now that I said I was kind of dieting, we came across two new food trucks that were really tasty and wanted to introduce you to. The Bacon Buggy is a cute red wagon that serves up all kinds of porky infused fun. Darla Lucerne, who is also a nurse, runs the truck with her husband, Robert, who is a certified BBQ fanatic, and all I can say is that everything we have had has been really good if not a bit decadent. 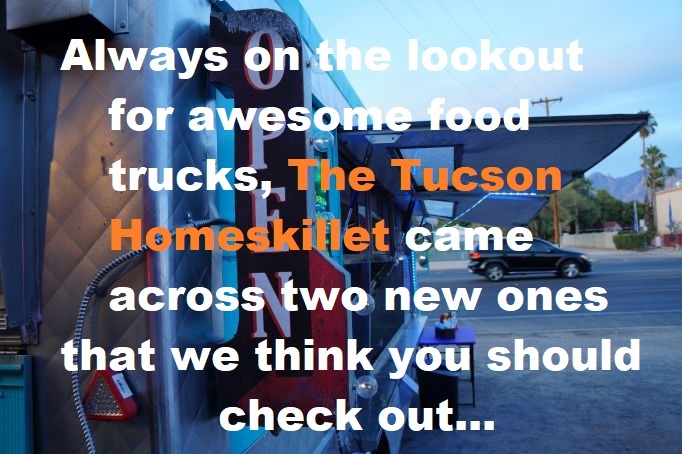 They have only been in operations since October of 2017 but so far they are doing the Tucson food truck business correct by keeping their menu tight and their appearances consistent. This is some deep fried realness but elevated a tad just beyond the reach of state fair fare. Plus for the price you pay you get a lot of food. Luckily they can be found parked in front of local bars and brew houses so after a few pints you are ready to gnaw down some comfort food yum. And the Bacon Buggy definitely provides the yum. 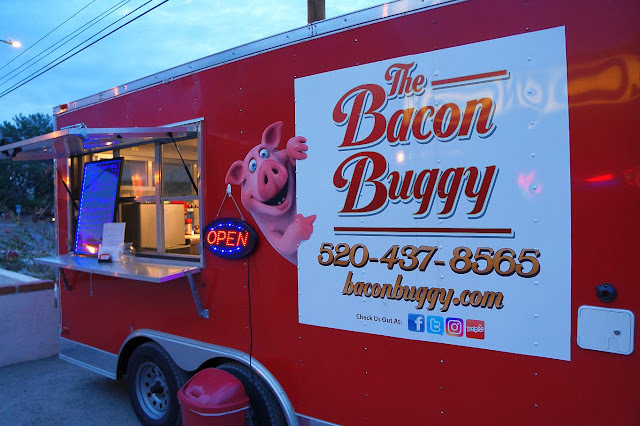 Like I said, The Bacon Buggy has maybe 10 items for sale on their menu, very smart for a small little food truck just getting started. They have these bacon burger sliders on pretzel buns that are drippy and very filling all at the same time. You can also get a side of fries done either regular shoestring style or curly. Get the curly fries! Somehow spirlizing potatoes before deep frying them just adds something to the taste and texture. Perhaps it is just a psychosomatic reaction going back to school lunches or food stands at county festivals. Doesn't matter. Just get them curly. The fried pickles were nice and crisp and not too dilly which is preferred because if you have a heavy dill accent on your pickles something does not translate well when you fry them. Not too sure why. I'll have to look into it. And I like dill pickles! Just not fried. 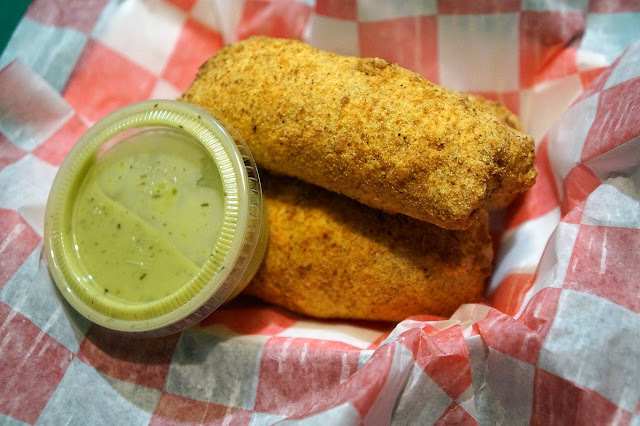 But the bacon and cheese stuffed jalapeno poppers are just plain nuts. Each one weighs about a pound and they come paired with a avocado dipping sauce. This is the stuff one craves when sucking down an ice cold beer and watching some kind of sport on the TV. You get 3 in a basket and they will no joke fill you up. I had one and was ready to call it quits. So good and a little spicy too. Here's the thing, and here is a bit of a throwdown: Bacon Buggy probably has one of the best BLTs in Tucson. If not southern Arizona. Now, I have had a lot of BLTs in my time and their version is near divinity. Of course the bacon is cooked to perfection, not too crispy, not too floppy, but the thick cut, vine ripe tomatoes and a good handle of crispy lettuce nestled between grilled sourdough is just magical. So when you spot the little red wagon with the smiling pig on the side, slam on the brakes and get you a BLT from these guys. If you don't like it, contact us and we will refund your money. And by refund your money we mean we will laugh in your face because you didn't like their BLT. It is that good. 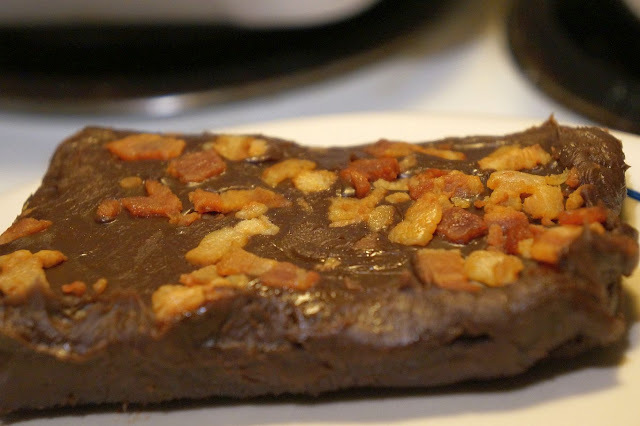 Oh and they usually have this really fudgy chocolate brownie topped with nuts and, yes, bacon!, on hand. Darla said that she does not make them but a local baker going by the business name Green Fairy Pastries, does, who, apparently, also makes booze infused desserts and treats. Hmm, need to check this one out. Sounds like something right up our alley. This is a pretty sizable truck run by a pretty petite lady. Alex Schlecht commodores the baby blue Mama Bear's Cafe truck with the aplomb of a drill sergeant and puts out a mean product. Her menu may seem a bit big for one person to handle on a busy night but the components are just variations on several themes. The same chicken used for a sandwich also goes into a salad and items from salads go into sandwiches...stuff like that. And I love it when food trucks serve salad. Sure I always like me a burger from a parked cart but, sometimes, especially when its hot out, I do crave me a nice salad. You gotta have that balance. And Mama Bear's has got the balance. Alex has a really good thing going here and I hope she can find some reliable help because on certain nights when she gets slammed you're going to need an extra pair of arms to sling out the deliciousness without having people wait. So far though we have had no problem with the service. She knows what she is doing and she's got the speed and drive to deliver a good, and tasty, product to you on time. So for that we say: Yay Alex! There are always daily specials so be prepared to have different yummy bits coming your way. 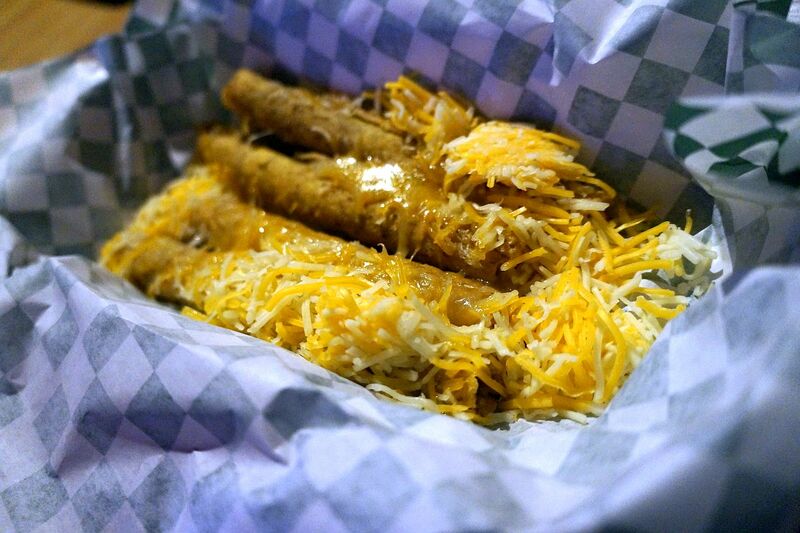 One night she had these really good taquitos that were smothered in cheese and salsa, a great snack if that's all you need. 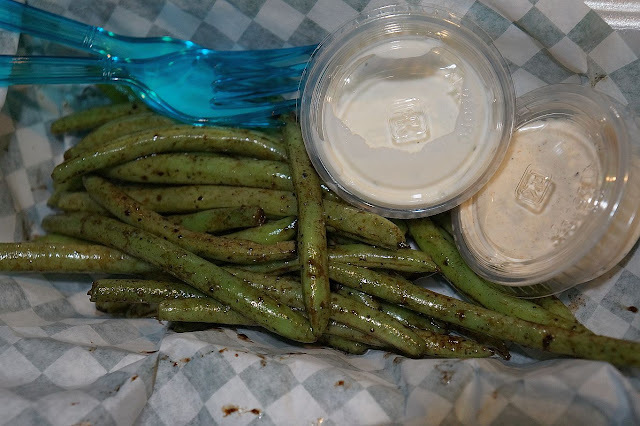 Another time she had green bean "fries" paired with homemade ranch and this Cajun jerk sauce. The beans were sauteed and seasoned really well and had a very nice snap to them. Hopefully she'll have this one again because we couldn't stop eating them. The Pineapple Chicken Salad was really good. Sitting atop a bed of leafy greens are sweet peppers, toasted coconut, cilantro, green beans (see...repurposing! ), grilled chicken, fresh pineapple and drizzled with that jerk dressing. 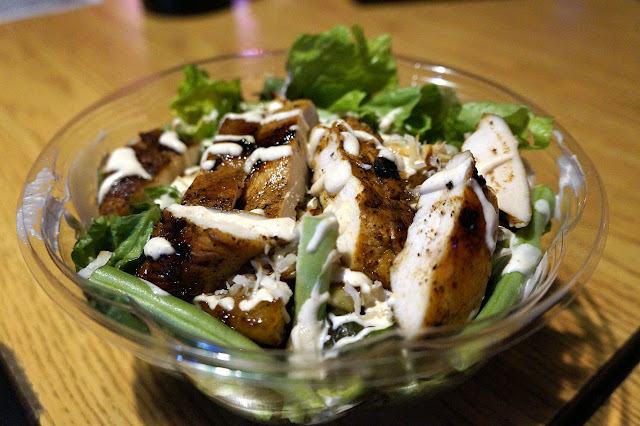 She also does a Chicken Caesar Salad and a Caesar Salad Sandwich too. The pineapple used for the salad is also a big element in her Hawaiian Chicken Sandwich that was one of the best sandwiches we've had from a truck. The chicken was seasoned and cooked perfectly and paired with ham, red onions, grilled pineapple, Swiss cheese, lettuce, mayo and a sweet Hawaiian sauce. 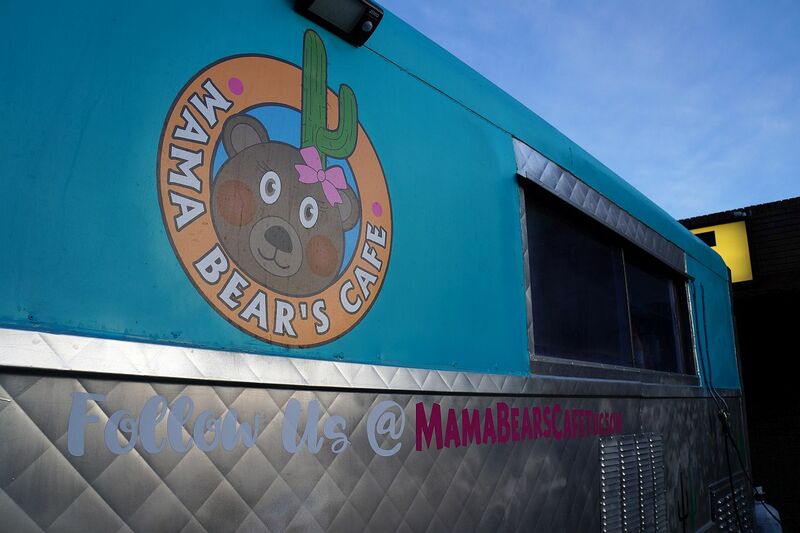 The Mama Bear's burgers are really good as well. She has a classic cheeseburger, a California Burger with 1000 island dressing, a Patty Melt, a Mushroom Swiss Burger but my favorite has to be the Sriracha Pepper Burger. Oh man, not only is this thing delicious but it packs a spice wallop as well. 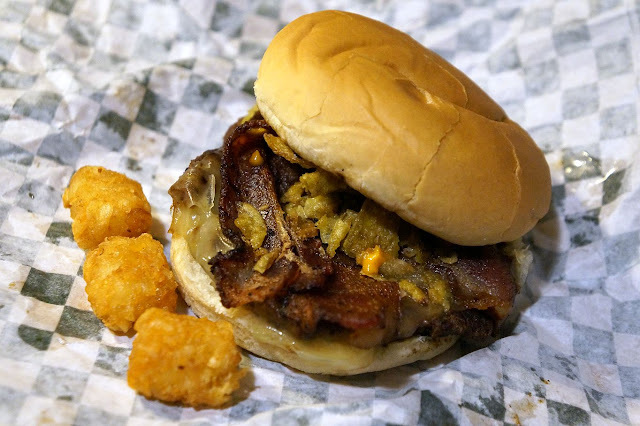 Ok, yes, there is Sriracha, of course, but she also climbs on peppered bacon, pepper jack cheese and fried jalapenos as well. We like it spicy here in Tucson and, well, Alex gives us the goods. 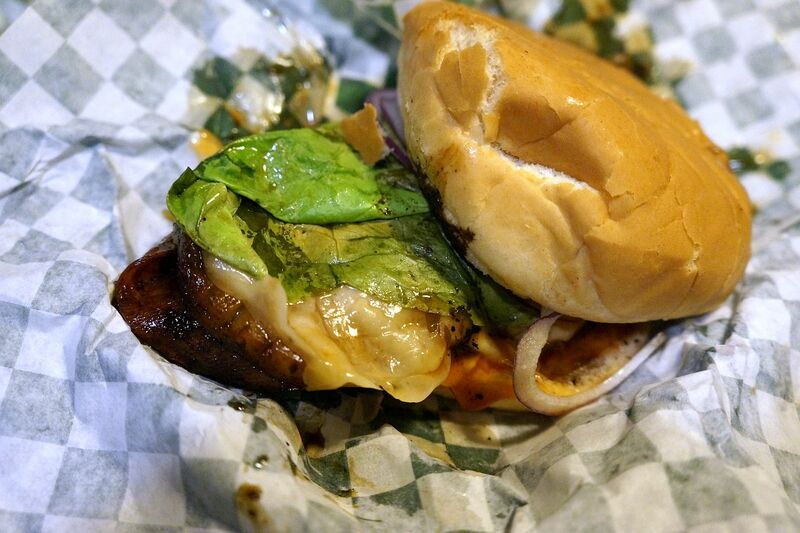 Nice thing was is that the burger wasn't too spicy; just the right amount of heat without any real pain. You can get your spice and enjoy it too. Did I mention Alex has tots aboard the Mama Bear's truck? Oh yeah. Ten thousand points to Mama Bear's! Mama Bear's serves breakfast. Like all day, anytime breakfast. We are now huge fans. She's got this Breakfast Burrito that is huge and filled with all kinds of egg, potato, cheesy goodness with a choice of ham, bacon, sausage or chorizo. That or a Breakfast Sandwich on homemade bread, a fried egg and the best part - American cheese. Sometimes you just have to give it up and eat a slice of American cheese. It'll make you feel patriotic. Best of all is that Alex serves pancakes. Are you kidding me? 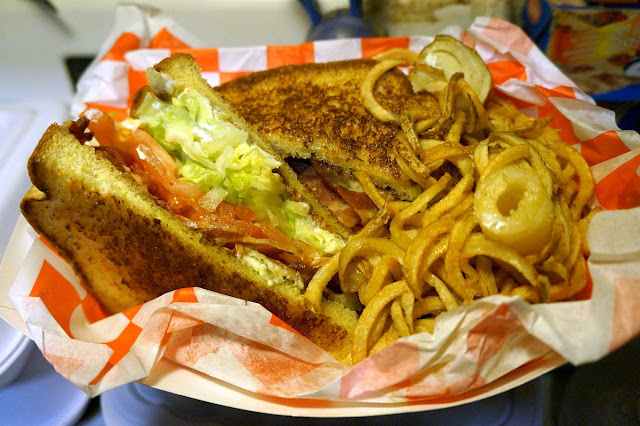 Can you imagine coming out of a bar, chock full of firewater and there is a truck right in front of you serving up stacks of fluffy goodness? Pure heaven. Try the Cinnamon Roll Pancakes made with a cinnamon sugar swirl and topped with frosting. Oh dear all things sweet and delicious, so amazing. She also does Tropical Pancakes made with pineapple (gotta love that pineapple), coconut and macadamia nuts then topped with a vanilla glaze. Yikes. This stuff is going to give some Tucson breakfast staples a run for their muffins. So a big Homeskillet cheer for Alex and Mama Bear's Cafe! 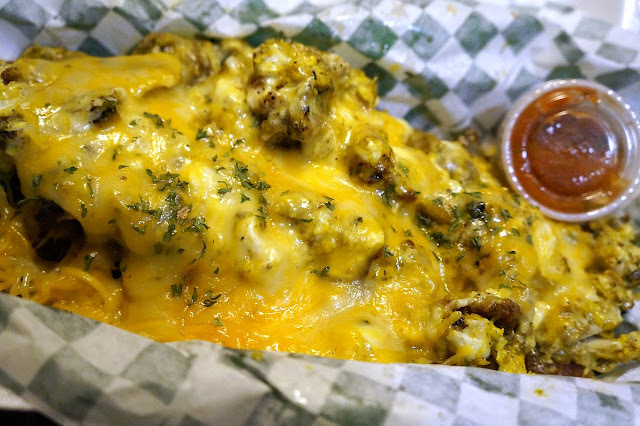 There you have it: Two new food trucks to keep an eye out for. I've supplied hyperlinks to their websites but it is up to you to follow them on social media to see where they are parked next. Thanks for reading kids! Hopefully we'll bump into you by one of these carts. "A Truck Load of Mama's Muffins"